Taking care of others and as a consequence making a difference in their lives. The will to take care of people, or lack thereof, divides the world into two kinds of people: those who are against this unbalance and try to understand what to do for others, and those who do not. This was the essence of the homely of Father Rick Frechette, the unstoppable form of inspiration for all, particularly ABF. 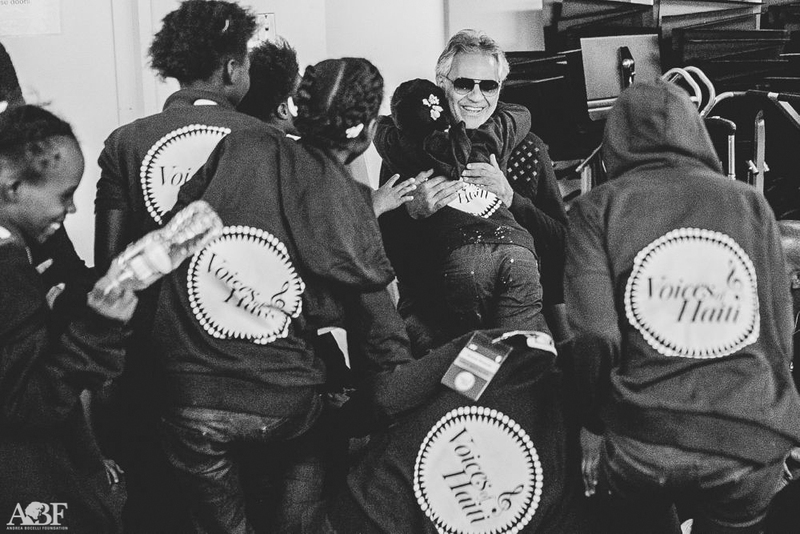 In an interview two days ago, Andrea Bocelli himself defined him as a ‘modern day hero’. Sunday morning, in the front rows of the Church of the Blessed Sacrament, sat the 35 members of our choir their blue and red togas immersing the church in colour. They are followed by Andrea, Veronica and hundreds of other worshippers. The weekend of the Voices of Haiti was dedicated to resting and the exploration of New York. Yesterday, the choir toured the ‘centre of the world’ … otherwise known as Times Square, the exuberant Little Italy and finally Broadway, where our young singers got the chance to experience the unforgetta ble Lion King. The news of the attack in Manhattan reached (and shocked) us when we were still in the theatre. Luckily, the updates were not too as tragic as we initially feared. The city’s precautions and worked were as such that we managed to reach the hotel with no further delays or problems. The next day, after the Holy Mass, which showcased Andrea and the choir, and after breakfast in the sacristy, other memorable experiences awaited our young musicians. Thanks to another generous gift by Bob Book, the entire groups was invited on a boat ride to see the Statue of Liberty, and later to visit the ‘Top of the Rock ‘ with its incredible view. Father Rick spoke clearly during his homely, he is after all very much used to talking about the essence of things. Father Rick is both a doctor and a priest, who for over 25 years has had an unmoving will to celebrate and defend life, both in the church and in the operating room. From the Altar of the church in the Upper West Side of Manhattan, a strong moral appeal is given, calling for everyone to do his or her part. Calling from the words of the Gospel, citing that who does good in little things, will do good also in big things. He speaks of a lot of people of good will, including Andrea and Veronica, who have taken to heart the future of the Haitian peninsula, and how little things have progressively grown. 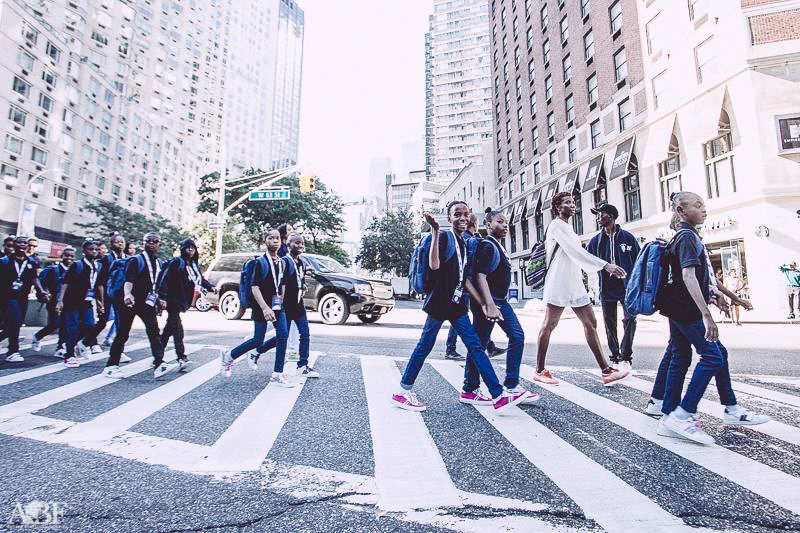 They have grown so much that they have performed for the United Nations, at Lincoln Center, Radio City Music Hall, Cipriani… And tomorrow for the ‘Clinton Global Initiative’. Father Rick recalled one of the many stories that have crossed his path. He spoke of a Haitian family, hurt by many problems regarding health and livelihood, but how their live had been changed and flipped around just because there was someone who cared. Father Rick explains that we have to first see how we can help people before we can take action, the children in our choir also come from difficult situations. However change thought ABF and the Fondation St Luc is possible and within five grasp, and it can make a great difference in the lives of many children. The slums of Port au Prince and galas attended by royalty would seem far too different worlds to have a connecting link. Because where there is a will (to take care of others), there is a way! The United Nations General Assembly will soon reunite most of the heads of state of the world in the tall glass building where our young choir performed the Haitian national anthem just yesterday. At the United Nations security check, the guards are not even letting in a small device, vaguely resembling a pencil sharpener that our cameraman forgot to take out of his bag. However, our young singers’ determination and strength, always aimed to at people’s hearts was not stopped by the detectors. In the words of Andrea Bocelli, who was called to speak at the United Nations ‘theirs, is a necessary revelation’. Andrea also spoke at the closing of the second “Global Exchange”: “It is easy and at the same time intolerable to see the difference between wealth and the most extreme poverty. Whoever really wants to change the world for the better, needs to foster revolutionary thoughts… not quite like the ones history has already seen. Those have already cost too much in terms of human lives, and have one by one almost always failed. I am speaking of the only possible revolution: an internal one which we all have to foster within us. 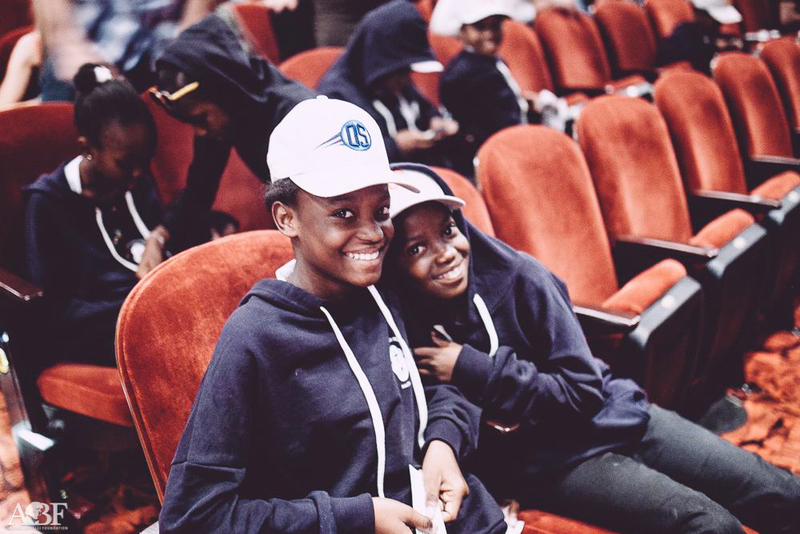 The young singers of the “Voices of Haiti” are ready, they want to fight for their people and make the Earth a better place and we have to support them along the way.” Music is a tool for development. Culture and beauty are used as strategies to relieve anyone out of their difficult situations. 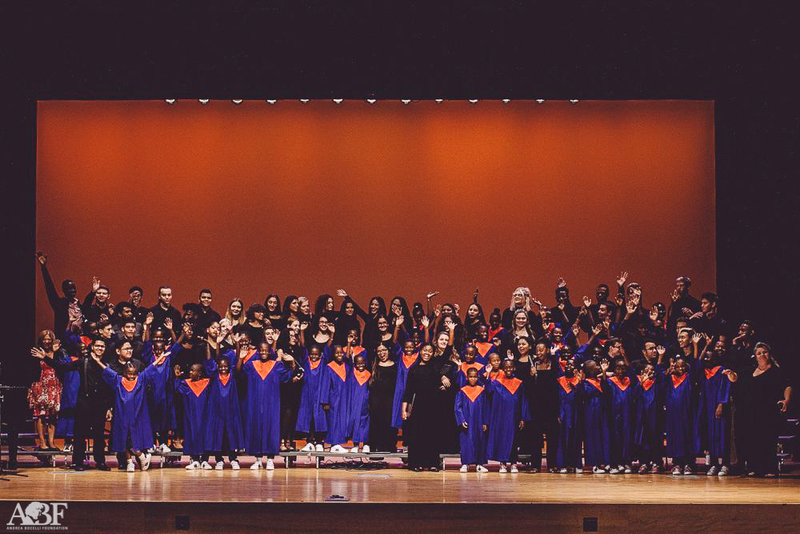 Music allows the beautiful souls of our young singers to flourish. The founder of ABF added, “today they are moving us, but tomorrow they will surprise us. These children have shown us so much beauty, and have thanked us with the light in their eyes. The seed that we planted in their paths, can really transform their country”. The children sand at the “Thank You Gala Dinner” and New York’s Cipriani in front of the Princess of Sweden. A real stage. And a huge stage at that! Radio City Music Hall has welcomes the young ABF and St. Luc singers. Behind them stands a 3-level orchestra, sorrounded by columns holding up screens. In front of the children stand 6,000 seats, and right beside them is Andrea, who just arrived last night from Italy. The count down to the debut of the “Voices of Haiti” is now only down to one digit. Just a few more hours until the inauguration of the “Global Exchange” at Lincoln Center, immediately followed by another historic performance, for Tony Bennett’s 90 year birthday. Tomorrow, more exciting adventures await, at the United Nations and the Childhood Foundation. The birthday message for Tony, sitting on the left of the stage at “Radio City” announces that “the best is yet to come” and this also applies to the young children of the choir. There is nothing that wipes away the smile, good mood and excitement even after many hours of rehearsal. The Maestro Eugene Kohn, finally has met “Voices of Haiti,” at the tenth floor of Lincoln Center. Many years ago, not far from here, he was sitting behind a piano to play for Maria Callas, and today he is welcoming his new friends and now “collegues”. The September sun illumites the path followed by our young Haitians, in a crowded, yet calm Manhattan. The air condtioning is the only antagonist in this trip, but the flu has not won over any of our young choir members. Yesterday night, suddenly, a intense rainfall drenched the Midtown. Once we (the adults) reached the bus, we were wet, tired and a little annoyed. The children were somehow even happier, as they kept saying “ it is a blessing from the sky, the sky is blessing our adventure!”. And for us, it was impossible not to agree with them. They are finally here! For one week they will showcase their voices in New York, reminding the world through music that education, culture and art are essential in order to overcome challenges. 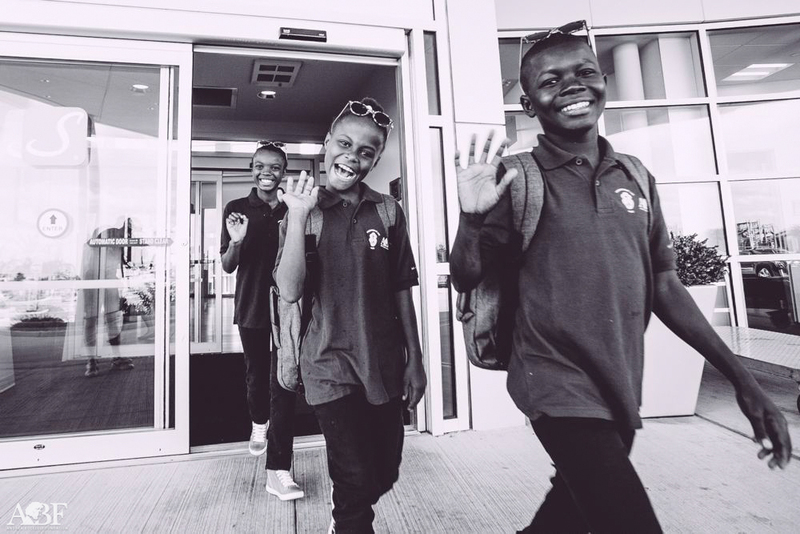 Just a few hours after their debut, the ‘Voices of Haiti’ have already warmed our hearts and filled them with joy. Their eyes, already glimmering back in the Caribbean island, have now filled with an even brighter light here in New York. As they live exciting new experiences and look up to the sky to see the unfamiliar shape of skyscrapers instead of the usual starry night sky. All this excited has however not taken away from their concentration. On the contrary, now more than ever, they have a burning desire to understand and learn whilst getting to meet (and very warmly embrace) new people. As they catch your gaze, they see the child that you once were. They celebrate you as you are, as we all are. They await for you to join them in celebration.